When my girls were little I felt it was an important skill for them to learn how to entertain, or play by, themselves. It mostly started as a need for myself to get some downtime, but I soon saw the many other reasons why this would be an important skill for them to master. Why is it important for children to have unscheduled time to just play? "Play has another important role in development: it helps expand a child's ability to learn. As they play, children learn how to solve problems intuitively rather than according to set rules. Because they enjoy the experience, they are motivated to use these problem-solving skills to process any later knowledge they acquire. That's a good thing. After all, we don't want our children to simply gain some sort of database of knowledge through education, and we don't want to simply indoctrinate them with our platitudes. We want them to understand the information they've taken-- to actively engage in it, not just compile the information. Enjoyment is a catalyst for owning what one is learning. "- Sally Clarkson. Learning how to entertain yourself, to be content when there's "nothing to do" builds important skills such as leadership, independence, and creativity. To be able to think for oneself, problem solve, build confidence and self motivation. To learn HOW to learn. 1. DO intentionally schedule time where the kids have "nothing to do". 2. Don't give in to their cries of boredom! This is part of the process. Often, when the word bored is uttered, or the phrase "there's nothing to do" , I will respond with some ideas for them, and those ideas are usually in the form of chores. It's amazing how quickly my girls find something else do to! 3. DO provide materials and space for whatever catches the child's heart at the moment. 4. Don't help them through problems or obstacles more than necessary. Part of the beauty of free play is for them to exercise their own freedom, creativity and problem solving skills. 6. DO be patient. If we have been going from one busy afternoon to the next with non stop obligations and activities, my girls can easily get out of the practice of knowing how to find their own things to do with an unscheduled afternoon. It can take a few days or even up to a week before they start craving those empty hours rather than expecting for some external entertaining force to show up. Give it some time, and make it a priority, and soon your children will be masters at play. Being entertained from outside sources (i.e. organized sports, music lessons, art lessons, etc) can be highly profitable pursuits. And they can be stepping stones and skill builders to use during unscheduled time. For example, the child who is taking violin lessons can now, in his free time, play around with the new chords he has learned and create a new song! Or the girl who's Grandma spent some precious bonding time teaching her to crochet, can, in her free unscheduled time, create a new dress for her doll. But don't let these "lessons" and other time obligations take over your days! Being careful to not over schedule your calendar is a very important part to insure that "free" time happens. It's a balance, and it's a lesson in recognizing your priorities, and learning to not say yes to ALL those great opportunities that come your way, just the ones that fit in with your priorities during that season. I'm noticing that "play" starts to look different as my girls get older. 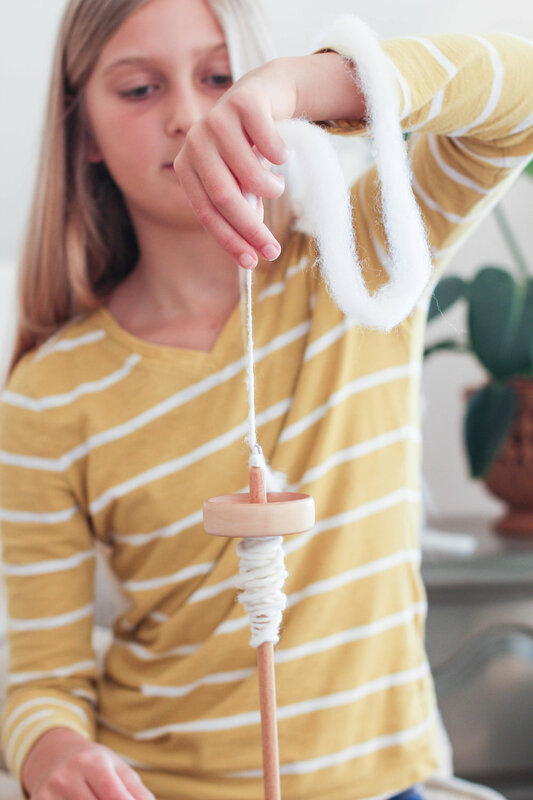 What once was playing baby dolls, has turned into miniature doll house homemaking and spinning wool. What once was scribbling, has turned into beautiful works of art. What once was running in the grass, has turned into being able to identify all the native wildflowers. What once was organizing her things, has now become running her own business. I would love to hear what kind of play your child likes best right now! I am writing this post as a stay at home mom who also homeschools my children. I spend ALOT of one on one, special time bonding with and educating my girls and am assuming that your scheduled free time is in balance with building a personal relationship with your children. I was recently asked how I find the balance between "interest led" education vs. "requirement focused" as a homeschool mom. I know that every home educator will answer this question differently, that is the beauty of the personalized approach to educating at home. If you follow me on Instagram, you will notice that we spend a lot of our time outside on adventures, or at home you'll see the girls being super crafty and creative making up their own "interest led" projects. From Ruby running her own business to Ginger making paper dolls, I feel like this is where the real learning happens. Not in finishing workbooks or following the same topics the local public schools are teaching. How do we find the time to spend so much time outdoors in nature, when there's other necessary school work to be done? I feel like being out in nature IS necessary schoolwork! But if you mean, learning to read and write, etc. vs. playing outside, I find a way to make "playing outside" a learning experience. If, for example, we discovered a cute little caterpillar in the backyard, the girls (at whatever level they are in) can retell the story of the metamorphosis in their journals (language arts). We can also research his name and learn his characteristics (science). We can read books about butterflies (literature). We do still have a structured morning of math, history, science and language arts. But I definitely don't feel the pressure that my girls need to be in a certain grade level in math, for example, or need to finish their book by the end of the year. What I'm more concerned about is if they are understanding the concepts being taught, and if they have a good attitude when things get tough. I believe this will serve them far better than being able to tell people they finished Algebra by ninth grade. Once an atmosphere of education takes root in your lifestyle, I really believe that fundamentals are getting taught, but more so wrapped up in a package custom fit for each child. Finding the delicate balance between interest led learning, and educational fundamentals can take time and patience, with plenty of mistakes. But as long as we continue to try to find the right combination for each child, I feel they can only prosper. After the extra rain we got this winter (thank you El Nino! ), Ginger discovered a whole new world in the backyard. All kinds of new and interesting things were growing and living there. She quickly focused in on all the caterpillars hanging out in the fennel bushes. She would collect a bunch, watch them eat the fennel, and then put them back. This particular guy the girls decided to keep in a vented jar to watch him make his chrysalis. When he makes his chrysalis, he attaches himself to the stem of the plant with a little thread and then proceeds to encase himself in a beautiful green covering that has yellow dots down the back. Much like this one. He stayed in his chrysalis for a couple of weeks, maybe even three. The morning Ginger found him emerged from his case and sitting in his jar was pretty exciting! We were expecting him to fly away as soon as we opened the lid, so we carefully carried him outside and got our cameras ready. We didn't know that it would take about an hour for him to dry his wings out and actually be able to fly. He was pretty helpless in the beginning, with heavy, damp wings. He preferred to hang upside down, since he couldn't hold his wing up on his own yet. Ginger put him back on his fenel after a while and he found himself a safe spot back down in his jar until he was ready to fly off. What a spectacluar show it was! A trip to the pumpkin patch is totally one of our highlights of the fall season. Our weather hasn't changed really from summer, so it's also one of the ways we celebrate the change in seasons, whether we can physically feel the change or not. We take a hay ride out into the field, and search for the perfect pumpkin. Back from the field, we get side tracked with all the cute miniature gourds! They're amazing! Each one is different from the next, at only $1 each, we get tempted to buy them all up, but choose just one each. Thanks to my 10 year old for this picture of the pumpkins they came home with. And hey! it rained that night, maybe it's fall after all! In the end, the girls decide to put back their field picked, traditional orange pumpkins, for the pastel pink version. Of course, no trip to the pumpkin patch is complete without a yummy treat of ice cream from the snack barn. What does fall look like in your home?